In the four plus years of the Rebuild Lakeshore ministry we have had literally thousands and thousands of folks make mission trips to work along side of us on the gulf coast. Contractors and construction workers to teenagers and college students, soccer moms and business men to senior adult groups, and everyone in-between have pitched in and accomplished their part of the efforts God continues to do in our community for his glory. This is a story about a mission trip I took with Baptist Collegiate Ministries (BCM) over Spring Break. It made such an impact on my life that I want to share it. When I signed up for the trip, I thought I knew what I was signing up for having already been to New Orleans on several previous mission trips. God got my attention from the moment we arrived. 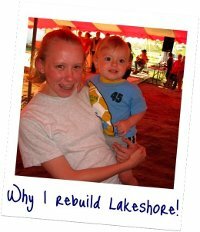 This trip to rebuild Lakeshore, Mississippi was unlike any previous hurricane relief trip I had experienced. God showed me and taught me many things. On March 14, 2009, I boarded the bus along with 21 other students from Berry College and Georgia Highlands College. Previous volunteers had warned our team of the biting gnats. When we arrived, the bus began to fill with gnats, and as we stepped out to get our luggage, we found them everywhere. Unpacking the luggage from the back of the bus, I began to wonder if I was going to regret coming to Lakeshore. When I got to the site of where I would be living, an old military quanza hut, and found I would be sleeping on an old military cot with my sleeping bag; I began to question myself again. The host church, Lakeshore Baptist Church, was itself in as much need as some of the homeowners who they were helping. This church was destroyed by the hurricane. The fact that there was not even much of a building did not stop “church” from happening. Here God showed me how a truly faithful congregation looks. The members of the church were devoted and maybe the most welcoming group I have ever met. Each week they open their doors to hundreds of volunteers who are visitors to their church. On our first day of work we were split into two groups. My group did many small, oddball jobs. Some of the things we did included helping around the church, completely demolishing an old RV and sorting its scraps. Then on the third day, our group was sent to a house. The homeowner had been gathering up shingles and taking them to the dump to dispose of them. When we arrived, four of us got in his car and took a road trip to the dump. During this time, we learned a lot about the homeowner. Once at the dump, we put on our gloves and climbed in the trailer and began throwing shingles in the dumpster. It was a small task, but it saved the homeowner almost an entire day because of our help. At the end we were not sure if we would see him again so we said our goodbyes took a picture with him just in case. I really enjoyed being able to go and help him. Two days later, we were told that after lunch we were going back to the house. This time we learned to fire caulk, and use caulk guns. One of the groups there that week planned a block party for the end of the week. We went out in the community with some other groups and went house to house handing out flyers and spreading the word. I will never forget how we had hesitated at this one house because the couple looked somewhat rough. We went ahead and not only were they interested in coming to the block party, they had previously donated some clothes and stuff to the church. One of the neatest things was seeing how everyone wanted Lakeshore to thrive again. Together we reached out to the community, rebuilt houses, and did small tasks for those still struggling to come back from the hurricane. I will never forget this trip. Oh and incase you are wondering, despite all the gnats I still would go back to Lakeshore in a heartbeat. I have no regrets.